Our little outreach team from YWAM Constanza arrived this past Monday to serve the city, pray, share their faith, and preach the Kingdom. They’re a sweet bunch, (two Bulgarians, a Brit, and an American), and my biggest regret is that I won’t be able to spend much time with them. I leave tomorrow for Portland for a five days of counseling, followed by three weeks in Kona (Hawaii) as both a student and teacher. I’ll be attending a seminar of the Character of God, and then teaching two weeks on Biblical Worldview and the Kingdom. Naturally I’m excited about the opportunity in Kona, but sad to be leaving my Sarajevo friends again so soon. Prayers for the time would be greatly appreciated. 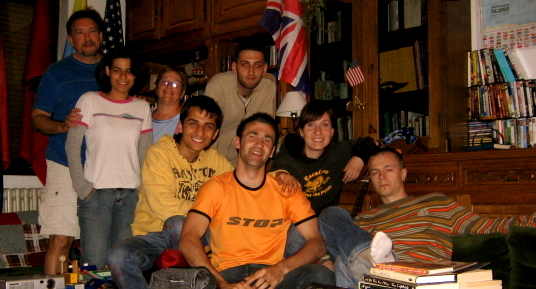 The Constanza team, Veska (white shirt), Lorraine (baby blue shirt), Mario (light yellow shirt with the big smile), and Leah (black shirt), with Bosnian friends Alen (stripes), Aldin (“stop” shirt), and Ahmed (beige sweater). It is equelly as hard for those who know you to let you go. I know there are some of us who would hold you near and not let you go where God has called. I being one of those who covets the times we shared daily face to face fellowship. You have a unique way to speaking into peoples lives, especially young people. So you must go. To speak the message of hope, and equip the believers to give an answer. Keep up the good work!